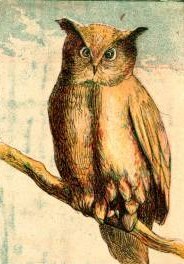 Vintage colored owl drawing for you to use in your next creative project. This owl looks a bit sinister but at the same time charming as he sits on a tree branch. Can’t wait to see how someone uses him in their art! My First Picture Book may not have been the first vintage book of vintage illustrations that I’ve found but it did include a number of nice images by the artist Joseph Martin Kronheim (1810-1896).